Do you ever regret getting a tattoo? This statistic shows the results of a survey among adult Americans who have one or more tattoos. 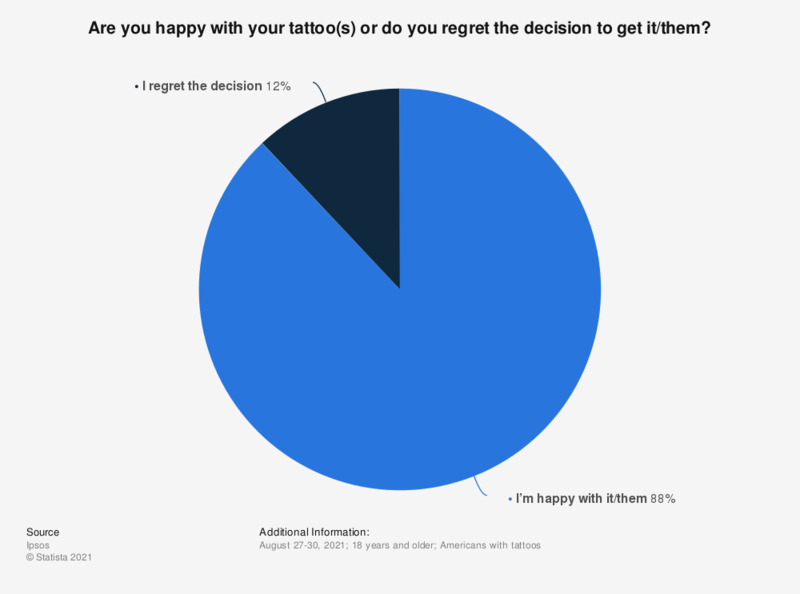 The survey was conducted in 2015, asking the respondents whether they ever regret getting any of their tattoos, or not. 77 percent of respondents stated they do not regret getting any of their tattoos. Everything On "Body modification in the U.S." in One Document: Edited and Divided into Handy Chapters. Including Detailed References. Statistics on "Body modification in the U.S."
Which percentage of you body is tattooed? Which areas of your body are tattooed? How old were you when you had your first tattoo done? How much did you pay for your last tattoo? Which of these would be reasons for you to have a tattoo done? Why have you not (yet) had a tattoo done? Have you ever considered having one of your tattoos removed? Why would you consider having a tattoo removed? Which tattoo designs or themes do you like for women? Do you like the following tattoo placements on women? Which tattoo designs or themes do you like for men? Do you like the following tattoo placements on men? Have you ever considered getting a piercing (excluding earlobes)? Do you have your earlobes pierced? Which areas of your body are pierced? Why have you not (yet) had a piercing done? Have you ever regretted having had a piercing? How old were you when you had your first piercing done? How many pieces of piercing jewelry do you own in total? How much did you pay for your latest piercing? How important is/would be a low price for you when having a piercing done? Which aspects are important to you in choosing a piercing shop? Which of the following cosmetic procedures have you already had? What is your position on these surgical procedures? What is your position on lip augmentation? What is your position on liposuction? What is your position on eyelid lifts? What is your position on breast augmentation? What is your position on breast lifts? What is your position on breast reduction? What is your position on sweat gland removal? What is your position on rhinoplasty? What is your position on facelifts? Do you generally have a favorable or unfavorable opinion of tattoos? Which of the following statements regarding tattoos do you agree with? Where do you look for tattoo/piercing inspirations? Do you visit online forums or platforms to exchange views on tattoos/piercings? Do you think tattoo design can be considered an art, like painting or sculpture? Do you think people with tattoos are more or less likely to do something most people would consider deviant? Compared to people without tattoos, which of the following characteristics do you think people with tattoos have? At which age would you allow your children to get/do each of the following body modifications? Do you find it acceptable for representatives of any of the following professions to have visible tattoos? At what age do you think someone should be allowed to get a tattoo without the consent of their parents? Do you think it is generally safe or unsafe for one’s health to get a tattoo? Italy: Do you have any tattoos? How comfortable would you be with a person with a visible tattoo working in the following occupations? Do you like face tattoos? Do you like traditional tattoos? Do you like animal tattoos?